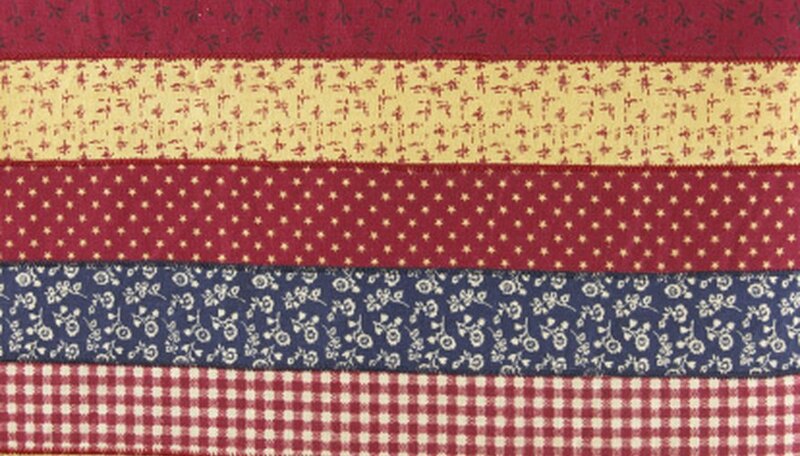 Fabric strip quilts are popularly known in the quilting world as jelly-roll quilts. A jelly roll is a collection of around 40 contrasting fabric strips, each 2.5-inches wide and 44-inches long, which is sold at fabric stores, rolled into a bundle, and tied with a ribbon. If you do not want the limitation of 2.5-inch wide fabric, you can cut your own strips to the size desired from larger pieces of fabric. The design of your strip quilt is limited only by your imagination. Simple strips of fabric can be used to stunning effect by sewing them together side-by-side and using the resulting piece in different ways -- vertically, horizontally or diagonally. Variations in the width and length of strips make interesting, contemporary quilts. Herringbone and brick-wall quilts are also possible when you use specifically sized strips and limit the number of different fabrics used. In addition to making decorative wall hangings or quilts for bedding or throws, you can use your strip-pieced fabric to make items such as tote bags, drapes, blinds, shower curtains and clothing items that include simply-shaped waistcoats, kimonos and jackets. You'll find inspiration from the many magazines and books available on quilting, and from websites dedicated to the craft. As your little girl grows up, she may leave behind a trail of cotton dresses that she grew out of long before the material was worn. Chances are a lot of these clothes ended up in a suitcase stored away somewhere. Cut strips of fabric from these clothes to make a memory quilt or throw. This makes a cute and usable college send-off gift. Raid your husband's closet for those unwanted silk ties that he's never worn, and visit your local thrift store where you can pick up a bunch of ties cheaply. Unpick the ties and wash the silk fabric gently by hand, ironing it while it is still damp. The quality of the fabric and variety of patterns and colors make interesting strip quilt fabric for projects such as purses, table runners and throw pillows. If you want to keep the shape of the tie, try sewing multiple ties together in a strip to make a circular Christmas tree stand cover. Cut small scraps of fabric into strips to form a beautiful bargello quilt wall hanging. Varying the lengths of the strips helps create the undulating wave formation of the bargello pattern. Achieving this pattern takes time and patience, but it's worth the effort because the end results are visually stunning.